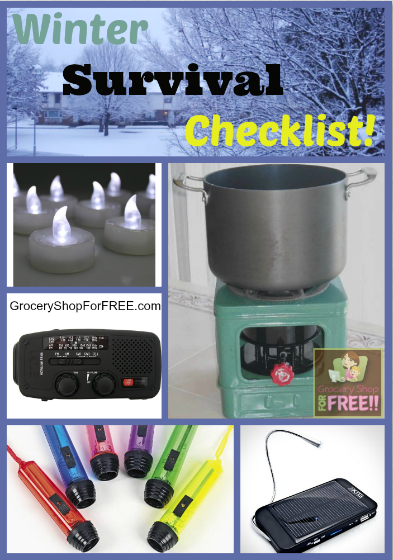 You are here: Home / Family Living / Winter Survival Checklist! I have obsessed over this topic for a while. Every year I gather tons of batteries and dry goods. I insist upon having a way to survive without electricity. I don’t have gas power so when my lights go out, I am in trouble. Those with gas stoves can cook without electricity but if you are electricity depend, this list is for you. Do NOT open your freezer or refrigerator more than once. You want to have a list of items to remove from the fridge so you do not waste any of that cool air that will be left in the fridge or freezer. This will help prolong the life of the goods within. Purchase plenty of batteries throughout the year. Do not wait until the lights go off to run to the store. The shelves will be bare. Look for batteries with Alkaline. Purchase flashlights, lanterns, tap lights, and candles. I purchase battery operated lanterns and candles after holidays. You will see kid lanterns on clearance after Halloween and candles after Christmas. Grab your cell phones and be sure they are charged. If not, a solar powered charger is always an Amazon away! Make sure your home is equipped with a weather radio. Tea light candles can be used to heat small items like cups of water. Most of the things listed here can be replaced by the use of a generator. They can be expensive and they use gas so be well aware before purchasing. Staying warm when the electricity goes off is very tricky. You should make sure to have plenty of clean blankets on hand for those frigged days. Blankets and throws layered on your bed will make for a good way to keep warm. Portable space heaters that require no electricity are great for keeping warm but make sure you have gas on hand. I like to keep hot hands products on hand for my children’s gloves and socks. I also use them on Black Friday when standing in long lines. Create a draft guard. This is a simple way to keep drafts from coming underneath your front door. Take two PVC pipes that are the width of the door. Sew the fabric around the pipes tightly and leave a flat surface in the middle so you can slide it underneath your front door. This will keep air from creeping in on those cold days. Apply weather stripping to your front door and windows. Re-caulk windows to help weather proof your home. Close off internal rooms so you can preserve the heat in those rooms. Spend plenty of family time together because your body heat will help you stay warm. Wrap the pipes in your home. You can purchase inexpensive pipe insulation at your local home repair store. Make sure you have plenty of weather friendly food in your home. I stock up on lunch meats in case of a power outage. We can eat sandwiches and the meat can stay cool in the cooler. We also put milk in those areas so that we can eat cereal for a bit of variety. Keep milk and bread in the freezer for emergency purposes as well. Emergency water should always be on hand. I purchase tons of water when it goes on sale (3L bottles, etc.). Pipes may burst in moments like these and could cause contamination. Have plenty of water on hand in case you do not have a way to filter the water in your home.